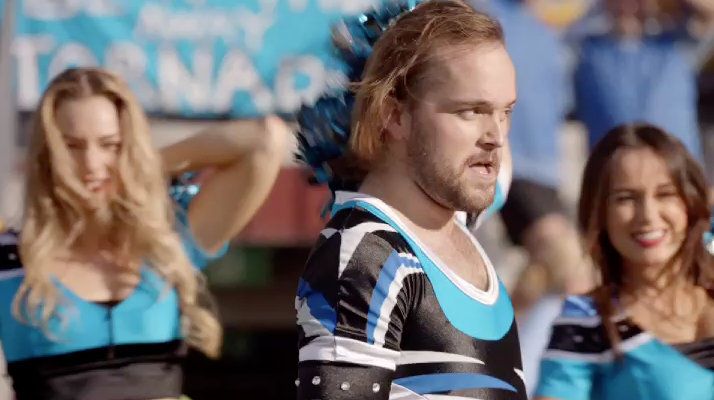 The male cheerleader here isn't all that weird, even though he looks like Jack Black's trash-eating hobo cousin, but he has to put up with ridicule from his parents and unceasing awkwardness at work as the only dude on a cheerleading team full of women. His uniform chafes, too. Still, he has found success on his own terms, and is functional enough to drink in a bar with other normal humans. The "He's one of us" tone is essential to ads like these. The most noteworthy thing here, aside from the cheerleader's Zoolander-esque uniform, is Foster's new slogan, "Why the hell not?," which seems a trifle fatalistic for a consumer product. They might as well snipe from Hot Shots and go with "Foster's: No one lives forever."